Editor’s Note: In the summary of the animal’s skills/abilities, those that are psi-based are shown in italics. Stats are provided for both editions of Mongoose Traveller, and for Cepheus Engine. Converting to Classic Traveller or MegaTraveller would not be difficult; a speed of 6m in Mongoose Traveller or Cepheus Engine is equivalent to a speed rating of 1 in Classic Traveller or MegaTraveller. Author’s Note: Cepheus Engine speeds tend to be somewhat slower by the tables on p.182 than the designs given above but the following can be generated by the rules. Referees who want the creatures ‘original’ speeds can adjust accordingly from the tables. Psionic strength has been added after a hyphen in the UPP. Skills from the above have been retained, if Referees wish to stick strictly to the list on p.48, Stealth, Deception, etc., can be ignored. Drarfs appears huge and ungainly, but are far more dexterous than they look. 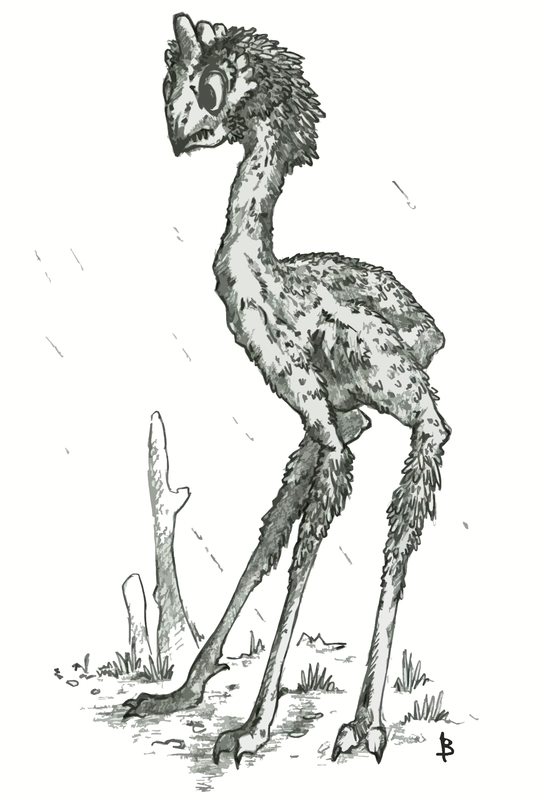 Drarfs are spindly three legged creatures reaching some 6-7 metres and weighing around a ton, these green/brown crane-like creatures look as though they ought not to be able to walk at all. They appear to be very ungainly but in fact are relatively dexterous and a herd of them moving over the savannah can be quite a sight. They’re usually found in social packs of a dozen or so with a matriarch leading the group. 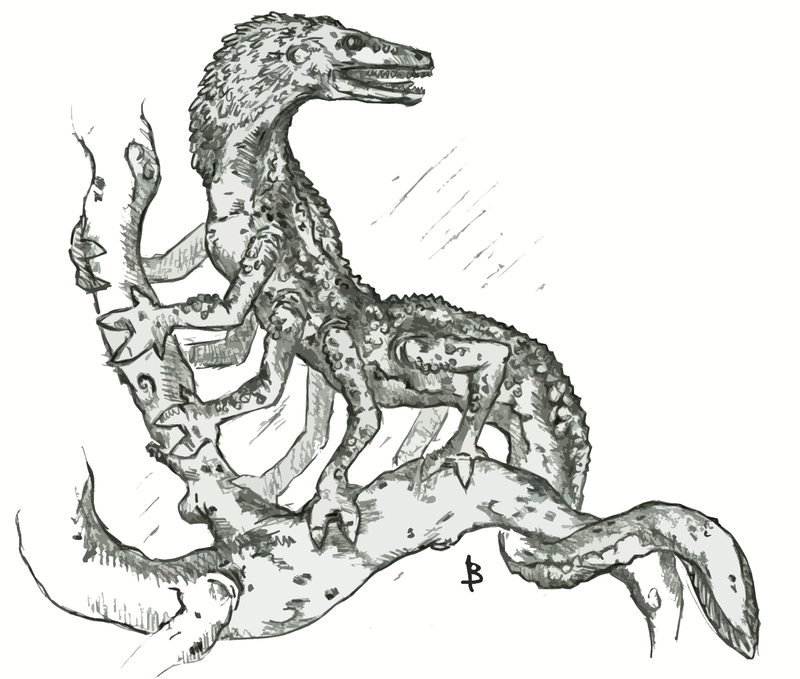 They feed on chitta-tweeps and chippers they find in trees and attack using a psionic Assault. They also have three stubby horn-like protuberances on their nearly spherical heads which they can use against their prey as well. Even in adolescence, the drarf looks a bit clumsy. 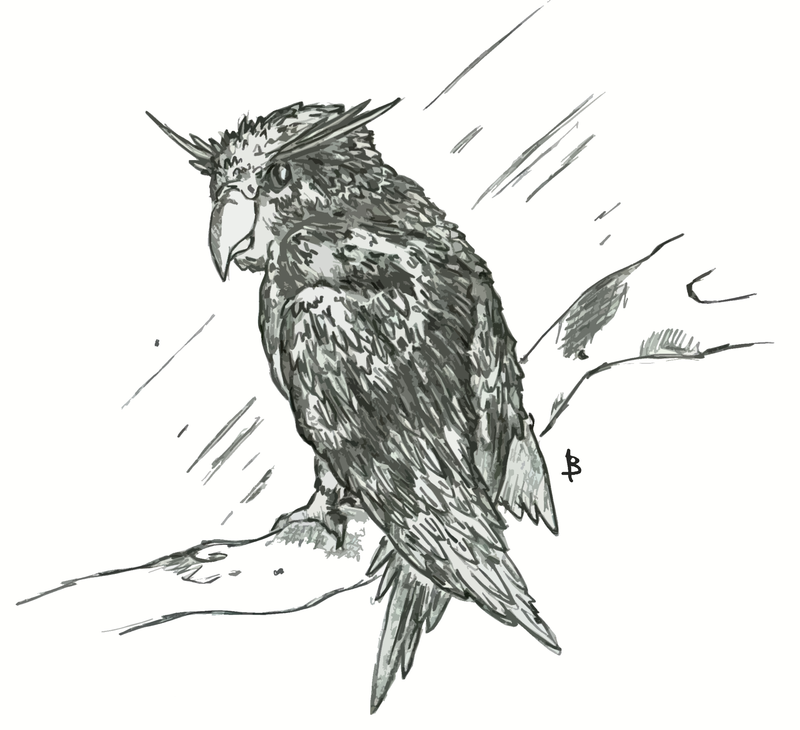 The chitta-tweep bears a resemblance to the terrestrial owl, albeit more colorful. 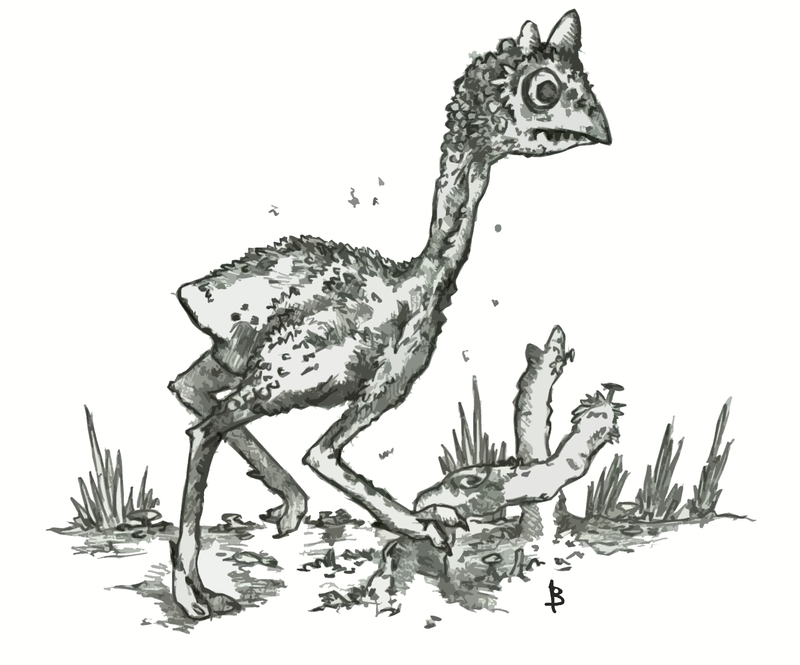 Anodorhynchus psionis. Bright maroon birds, very like four-toed parrots standing about a metre tall, with a wingspan of over a metre and weighing around 1.5kg. Their common name comes from the sound the males use as a mating call. Chitta-tweeps use Life Detect and Telempathy to locate the lamandas they primarily prey upon in the trees they both inhabit and on the savannah floor. With their poor eyesight, it can be quite impressive to see such blurs of colour flash low to the ground and pluck up an unwary reptile. They also prey on chippers. Chitta-tweeps have developed a limited form of psionic Shield as a partial defence against the drarfs who prey upon them. Some have been domesticated to keep as pets despite their size but they’re social creatures and don’t like being kept alone. One could write “Here Be Dragons” on the lamanda’s habitat on a map, and not be totally wrong. The lamanda is an eight legged lizard-like creatures with a prehensile tail. It’s an incredibly hardy animal for its size – around 15cm long. They’re very nimble and can keep running even if they’ve lost up to four of their legs. It uses Telekinesis to manoeuvre insects into range of its long tongue which it can roll up in the longitudinal axis to form a kind of straw. Humans find chippers to be unexciting pets. Vargr find chippers on menus in upscale eateries. Prolifically fertile, these small rodents are found in the trees and scrub of the savannah are easy prey for drarfs, chitta-tweeps, and any number of other creatures against which they have little in the way of natural defences. Their teeth can give a sharp nip to an unwary finger but they have to be provoked to this. In the wild they’re actually very hard to see and, perhaps unsurprisingly, disappear at the approach of just about anything. 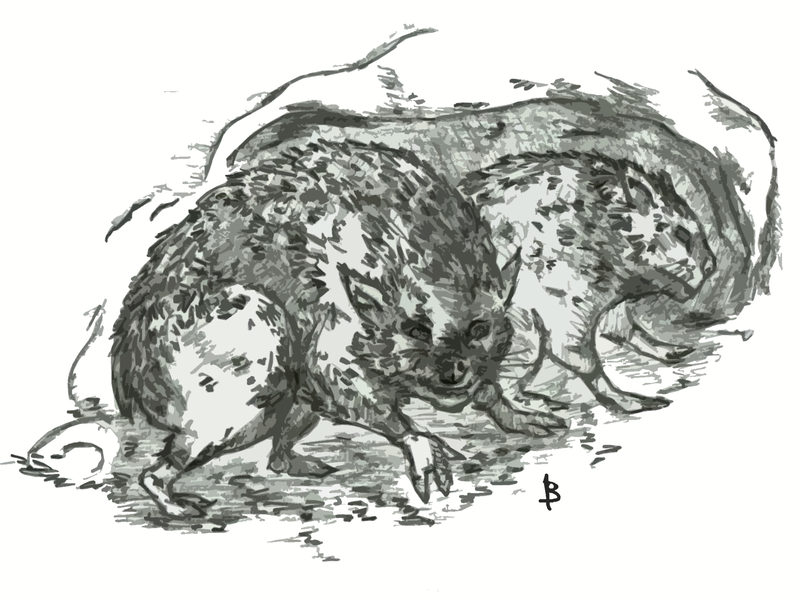 They can easily be domesticated – most Imperials find them quite cute – but they make unexciting pets as they rarely leave their burrows or nesting material. Vargr regard them as a small but piquant delicacy.